On Saturday February 7, 2009 a massive bushfire swept through the picturesque town of Marysville in Victoria, Australia. The bushfires, annual by nature, have spread over a huge region and although now are considered contained have been especially devastating this year, causing at least 209 deaths as of February17th. Arson is a probable cause of the initial fire. As we grieve the avoidable loss of human life and feel strong compassion for the people, animals and forests of this part of Australia, we mourn a particular casualty. Early in the fires most of Bruno’s Art & Sculpture Garden, located near Victoria were destroyed. Bruno’s sculpture was poignant and profound. Fortunately there was a documentary done of the gardens and art recently. This YouTube is an excerpt from the documentary. 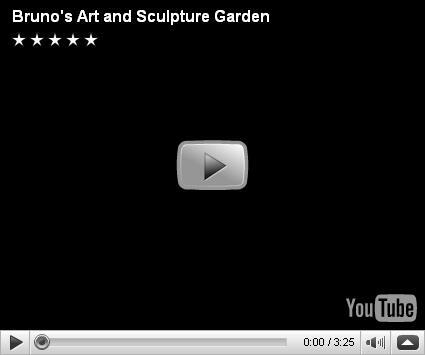 Please take a few minutes to take a tour of Bruno’s Garden. Your smile at the whimsy and gentleness of the sculptures will be bitter-sweet, as most of the garden is now gone. To our Australian visitors and friends, we send our sincere empathy.We hope that Bruno will in good time begin to re-populate his garden, now of burned out stumps and crevices, with the new spirits that will come to inhabit them. Thanks to Maria W. for sending me the powerpoint slides that got me on a hunt to find this video and info to post. Here’s a link to some ‘handmade help’ for the victims of these fires. Thank you so much for posting this, Beth.I had not idea such a place…existed, I guess is the sad tense to ouse here. He looks like a young fellow, hopefully he will be able to carry on creating. What a tragedy of loss on so many levels. Oh, my, Bruno’s art leaves me breathless. What an incredible loss, and devastation–the loss of his sculpture almost encapsulates the reality of the loss of all of the land and beings of the natural world from the fires. At the same time, it is a sharp reminder of the ephemerality of life on this planet, and the multidimensionality of our existence. Now that is a loss. I had no idea and thank you for this post.